This DIY rich body cream works wonders for the dry and sensitive skin (and skin problems like eczema). Have you tried everything for your dry skin? Try this extremely nourishing, oily, creamy, delicious body cream. This cream will put a stop to your itchy, irritated and dry skin. 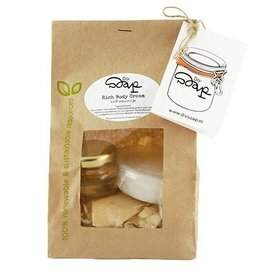 Rich Body Cream is packed with organic shea butter, organic coconut oil and almond oil. This is an easy cream to apply because of the airy and creamy texture it gets when mixing together. Beneficial for your skin and also smells like a touch of coconut! 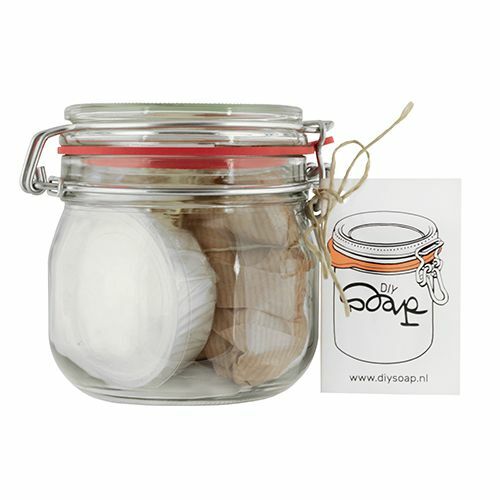 Rich Body Cream comes in a beautiful glass-preserving jar. Once the body cream is ready, small pieces of shea butter may still be left over. These melt in your hand as you apply the cream. This cream is a DIY package. We also have the same cream already made for you: I Kid You Not Body Cream. Did you know that we have a Body Cream Refill? This way you will only receive the ingredients, without a preserving jar. Not so much into DIY? 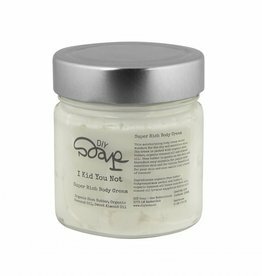 We also have this cream made freshly for you: I Kid You Not Body Cream. Tip: Doesn't body butter or body lotion from the drugstore work for you? Are you suffering from an itchy and sensitive skin? Try this Rich Body Cream. This cream really works, because the cream is a 100% natural and is packed with organic shea butter! Cooking time: 7 minutes. Requirements: mixer, bowl, spoon. The main component of the Rich Body Cream is shea butter. Shea butter is rich in vitamins A and E and is very nourishing and moisturizing. In addition, shea butter has a protective operating layer with mild antibacterial and anti-inflammatory properties. Shea butter is gentle on the skin and therefore very appropriate for people with sensitive skin and for babies. In addition to organic shea butter, the cream contains organic coconut oil and almond oil. Coconut oil intensively nourishes the skin and protects against dehydration. In addition, coconut oil has antibacterial properties. Almond oil regulates the moisture content of the skin and reduces skin irritations. The combination of these three ingredients ensures that the cream is very suitable for people with very dry, sensitive skin and skin problems such as eczema. The cream is also very suitable for children and babies. How Do I Make My Body Cream? - The Rich Body Cream comes with a detailed guide. - Put all ingredients in a large bowl. - Put the Rich Body Cream in the preservation jar and enjoy your soft skin! - The container with coconut oil is maize plastic and 100% biodegradable. Organic shea butter* (Butyrospermum Parkii nut butter), organic coconut oil, extra virgin * (Cocos nucifera oil), Almond Oil (Prunus Amygdalus Dulcis oil). 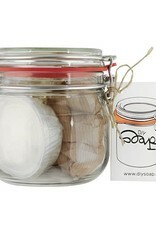 Make your own natural body cream with this DIY refill package with all the ingredients to make your own jar of cream. Wonderful velvety body butter. 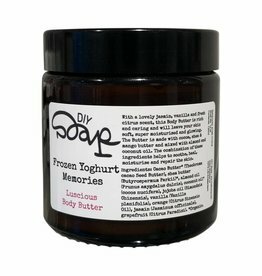 Nourishes and protects your skin and brings you back to summer memories with a fresh frozen yoghurt scent!